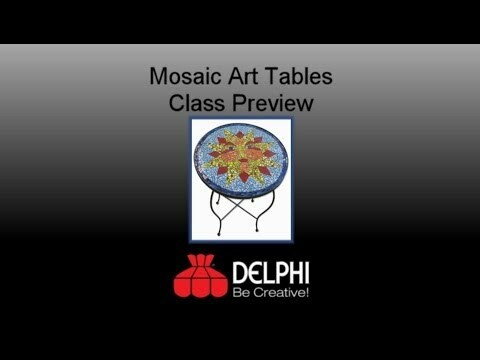 Class Description: Make a beautiful mosaic table for your home or for a gift! Learn the basics of the direct mosaic method that can be applied to many different surfaces. Students will begin the table top in class and finish the project at home. All steps for completing the project will be demonstrated during class. Using strips of glass and mosaic nippers students will create a sunface design using colorful stained glass. Students may bring another pattern if they choose instead of the supplied sunface pattern. Students with glass cutting experience may bring their favorite glass and cutting tools. Safety: Please do not wear open toe shoes if cutting or handling glass. Safety glasses should be worn; they will be provided if necessary. Additional Tools & Materials: Student s with glass cutting experience may bring their favorite glass and cutting tools. Note: Students may want to bring a snack/lunch for the 10am-2:30pm class. A break will be provided to go out for lunch. Pros : Roy is awesome, supplies and variety of available tools, patterns and glass is truly the best in the US at DELPHI Glass. I can’t wait to take another class!!!! Pros : This was our first class with Delphi and we enjoyed the class very much! Instructor (Roy) was informative, entertaining and very helpful. Having several color choices cut and ready did speed up the selection process. We look forward to coming back for another class! Cons : Getting started was a bit slow with everyone choosing a different pattern than the one that was offered, but it all worked out fine in the end! Pros : Class was so fun. Other Thoughts : I'm very satisfied with what it will look like. Roy is Great! Pros : So much fun and informative. Other Thoughts : I had a great time and am looking forward to seeing the finished result. Thx Roy!